I was naughty. I got the message. Uh-oh. Kitty's starting to spray urine around the house, and nothing you've tried so far has stopped him. What to do before he ruins more items and your house stinks to high heaven? Ask your vet about Buspar, which can successfully stop felines demonstrating "inappropriate elimination," as the euphemism goes. Buspirone hydrocholoride, marketed under the name Buspar, is an anti-anxiety medication developed for people. Veterinarians might prescribe it for cats that spray urine to mark territory in the house. It's not an instant cure, as Buspar takes a few weeks to change any behavior in the cat, but after about two months Kitty should stop spraying and you can discontinue the drug. That's the idea, anyway. It might not work in every case, but Buspar's success rate is higher than other drugs prescribed to stop cat spraying and inappropriate defecation. Like any drug, Buspar might cause side effects in certain cats. These include appetite loss, nausea, restlessness and drowsiness. It also can cause headaches. Kitty can't tell you his head hurts but keep an eye on him for any sign of discomfort. On the plus side, Buspar can make Kitty unusually affectionate. That sounds fine unless Kitty becomes so affectionate you can't sleep, watch TV or do anything else without your cat rubbing against you. Your vet won't prescribe Buspar if you cat has a history of liver or kidney disease, or if he's already on some other medications. Most cats receive a 5-milligram Buspar tablet twice a day by mouth for the first week. If the cat has no apparent side effects, he receives one tablet daily in the second week. Your vet adjusts the dosage according to your cat's size and reaction to the medication. Don't stop giving Buspar to Kitty without speaking with your vet. You'll know whether or not the drug is working within the two-month time frame. At that point, you can probably stop giving your cat Buspar if it's successful, as it appears to cure the problem, or you can stop because it didn't work. If Buspar doesn't work for your cat, don't give up. There are other medications that might do the trick, including Prozac, Valium and Elavil. 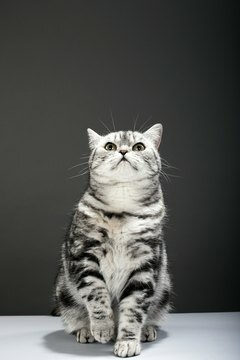 You can try other behavior modification techniques, such as buying new litter boxes or having more than one litter box for the cat to use. Avoid litter boxes with a top -- some cats don't like them. Experiment with different types of litters, especially non-scented ones. You can spray odor neutralizers around the area where your cat is spraying or pooping.